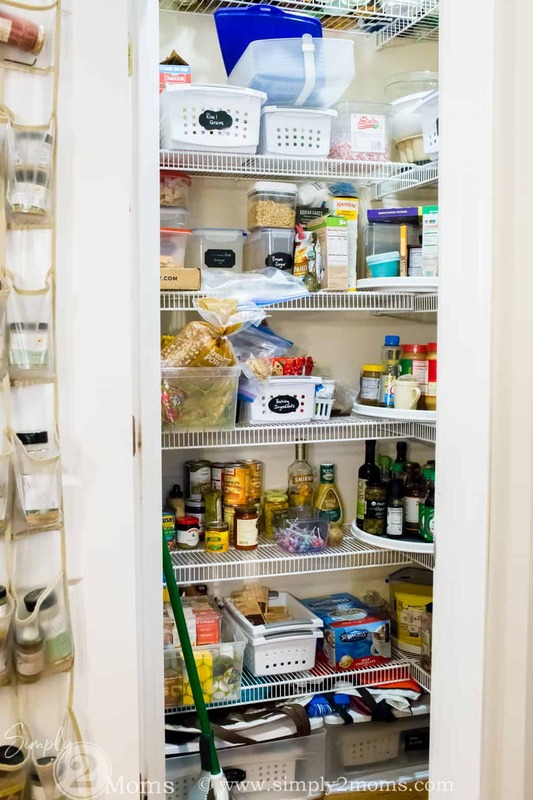 Raise your hand if you need to organize your pantry! Just two weeks ago I would have been waving both my hands in the air. And jumping up and down. Because my pantry had become a big mess over the past few months. 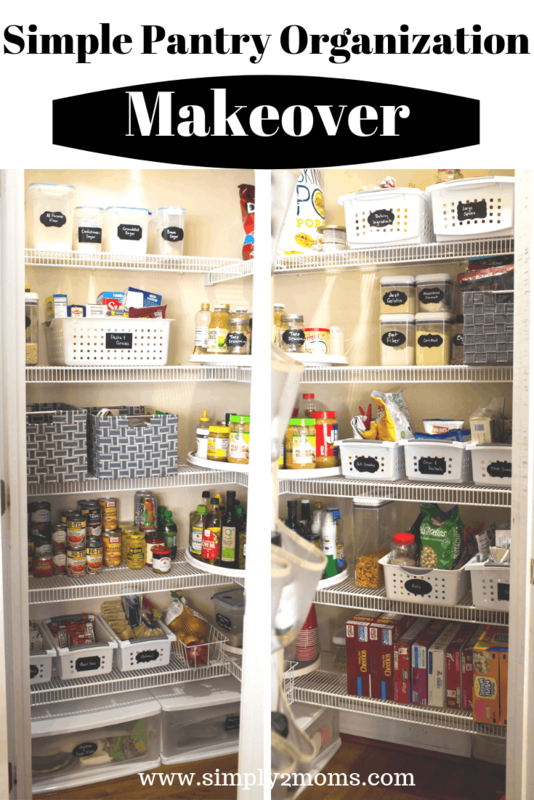 I had started organizing my pantry two years ago and definitely made some improvements. I wish I had THAT before picture to show you! There were no bins. Everything was just shoved in. I ended up having to throw away so much food that had gotten lost in the back corners and was so expired. Have you had that happen too? I mean, there were some jars of jelly that had expired FIVE YEARS earlier. You can see the start of the new, high shelf we installed. And everything else was just crammed in where I could fit it. 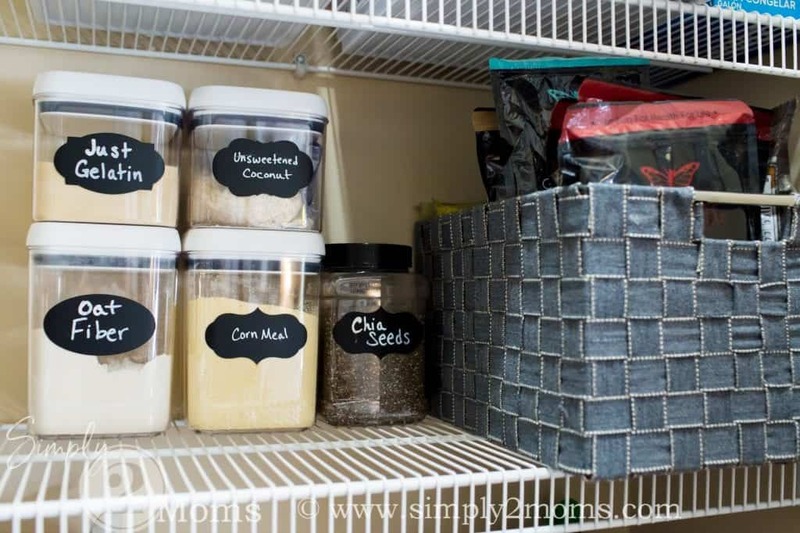 I had 3 large tubs that really became a way to contain small stuff, but there was no organization to them. So clearly I’m doing WAY better than I was. But it still needed a cleanout and a few more solutions for areas that I noticed after getting more organized. But before we talk organizing, let’s talk lights. Do you see how dark my pantry was? I’ll wait while you scroll back up to take a look. I know this is a total first world problem. But as long as we’ve lived in this house, this has been a pet peeve of mine. I wish we’d had it wired for an overhead light, but I never thought about it when we were building this house. 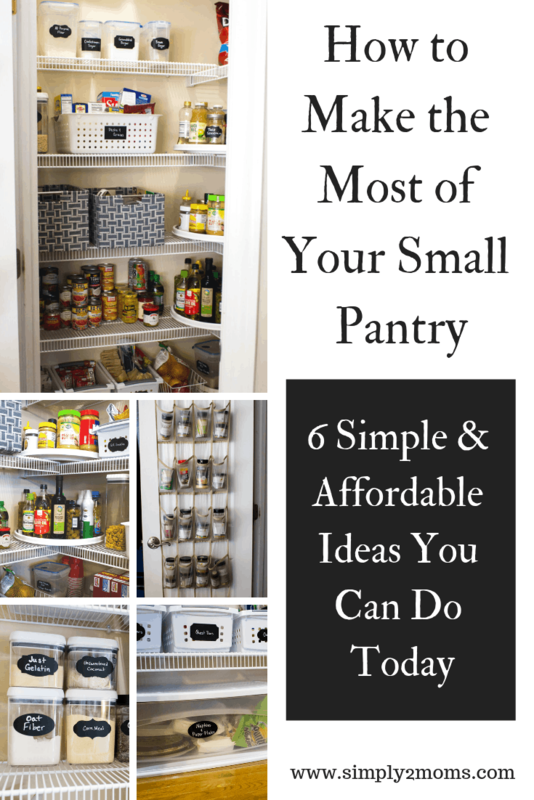 I was just so excited to have a walk-in pantry! We’ve tried a variety of tap lights but they are never bright enough and the kids always forgot to turn them off. Let me introduce you to my solution! 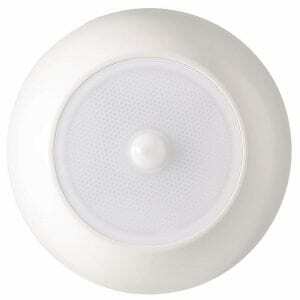 This is Mr. Beams MB990 UltraBright Wireless Battery Powered Motion Sensing Indoor/Outdoor LED Ceiling Light. It is amazing! Look at how bright it makes my pantry! Of course, now you can see the mess better. But still. I love it so much! If you have somewhere in your home that needs an overhead light too, you can get one here. 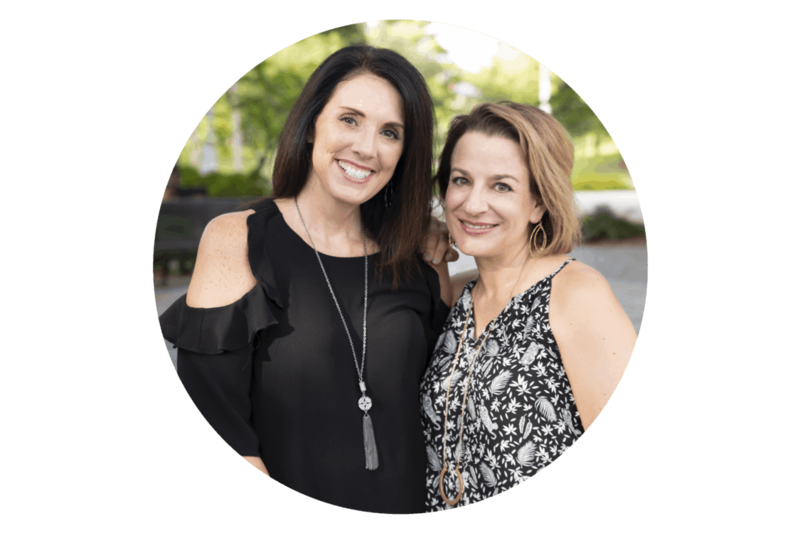 Take a look at what a difference that one change made! 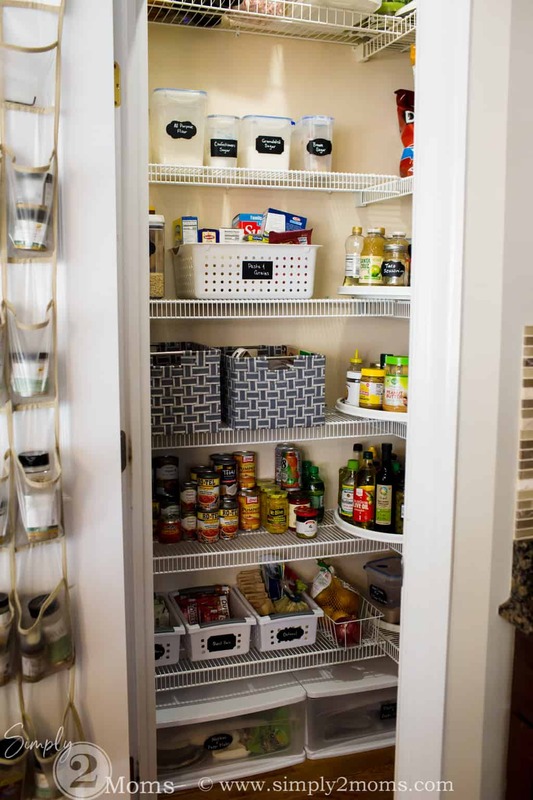 And now that we can see, let’s get down to the nitty-gritty of how to organize your pantry. This is the worst part. But it’s got to be done. And while you’re at it, go ahead and throw away anything that’s expired. This is a great chance to start your organizing! My family of 5 eats at home 6 nights a week. Our kids pack lunches and snacks to take to school. My husband and I both work from home so we generally eat lunch at home. Breakfast is also eaten at home. I’m a meal planner, but I also like to keep certain staples in the pantry. We buy some items in bulk from our local BJs and from Amazon Subscribe & Save, so at the start of the month, our pantry is more full. I have one daughter who is gluten intolerant so we need special ingredients for her. I follow the Trim Healthy Mama lifestyle so have some special ingredients that I use for baking. We have “regular” baking ingredients too. We installed a high shelf that’s out of reach without a stepstool. I use this shelf to store appliances and other kitchen items (like my turkey roasting pan) that I can’t get rid of but don’t need to get to regularly. 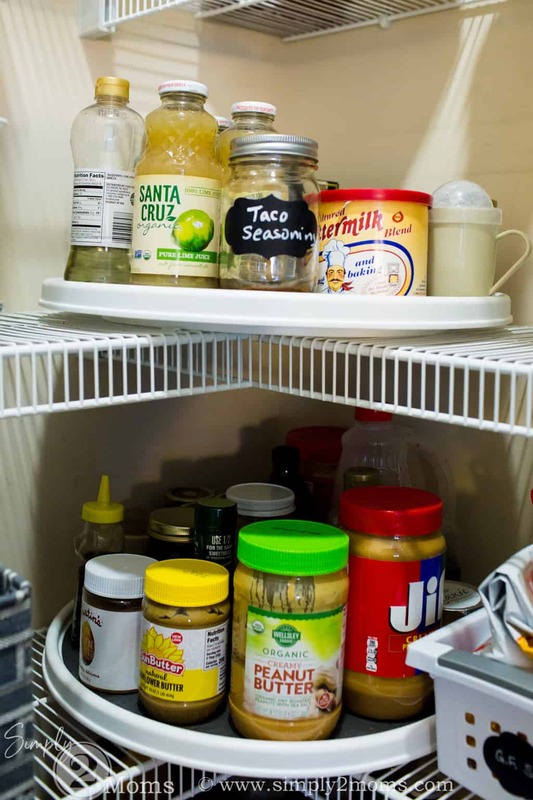 That leaves more space on the other shelves for food. Because we purchase many items in bulk, I decided I wanted to move the individually packaged items into baskets. This allows me to throw away excess packaging (since so many packages are filled with lots of air!). 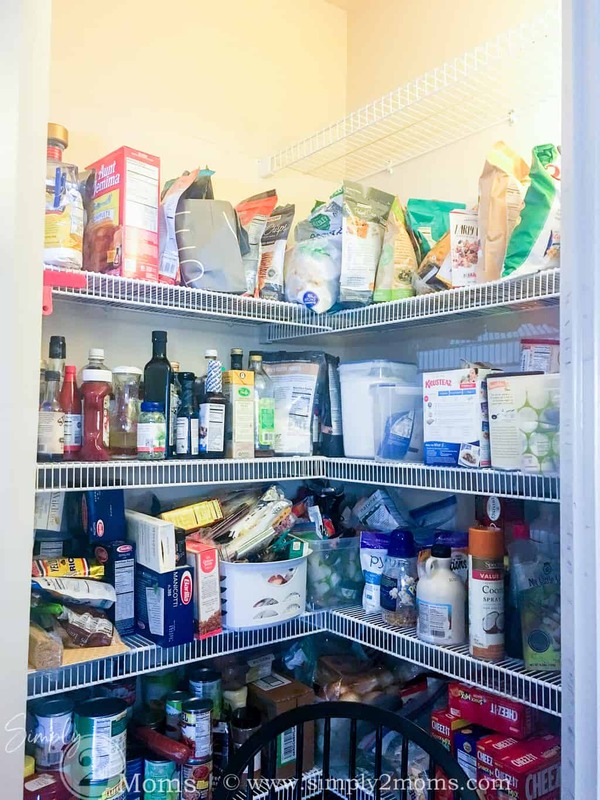 I also have chosen to store ingredients like flour, sugar, sweeteners, etc. in canisters. This lets me stack them, see what’s inside, and avoid spills if bags aren’t properly closed (hello, kids!). I also chose to use large turntables/lazy susans for the corners. Now items don’t get lost in the back. I use these 18-inch Lazy Susan turntables. This is the fun part! You get to choose what types of containers would work best for your needs. I opted for a variety of inexpensive plastic and woven baskets, clear canisters, and an over-the-door shoe bag. 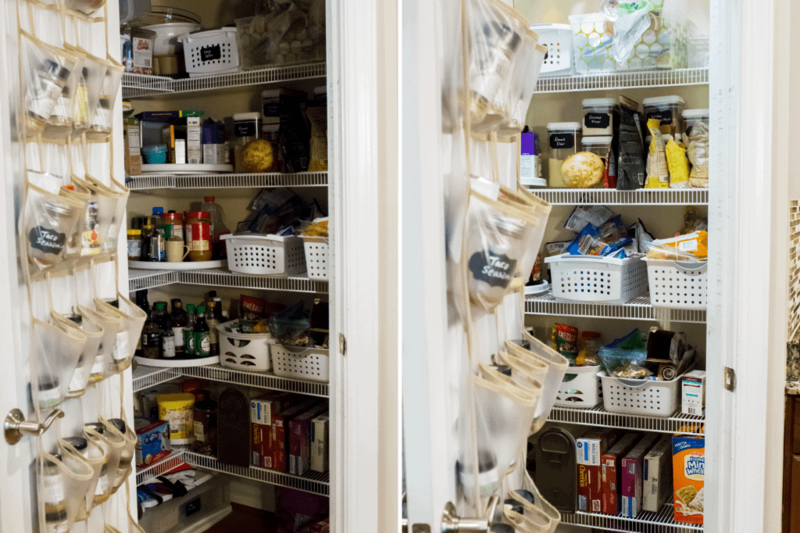 As you put everything back in your pantry, try to group like items together. It’ll be easier to find what you need and you’ll be more likely to put things back in the right place! I chose to put all my seasoning blends and packets in this over the door clear pocket shoe bag. 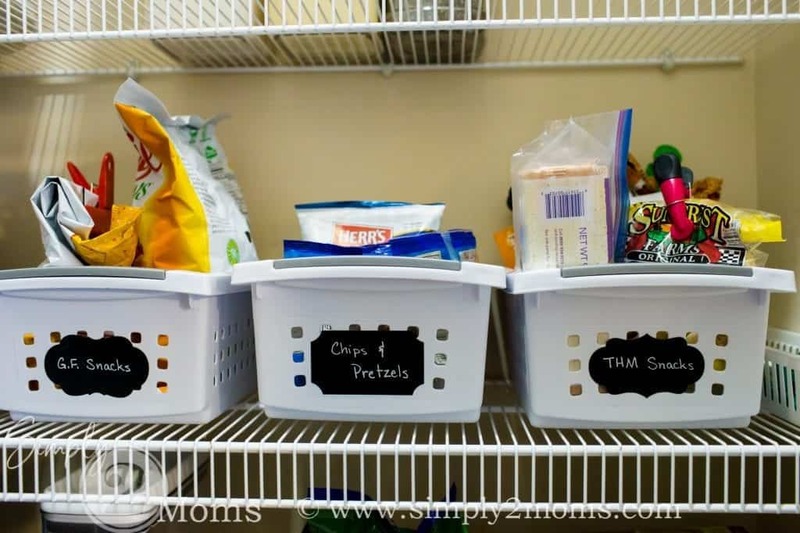 This is one of my favorite ways to store a variety of things in my home! Craft supplies, cleaning products, toiletries, mittens/gloves all get stored in these. I like these simple plastic buckets to contain similar items. 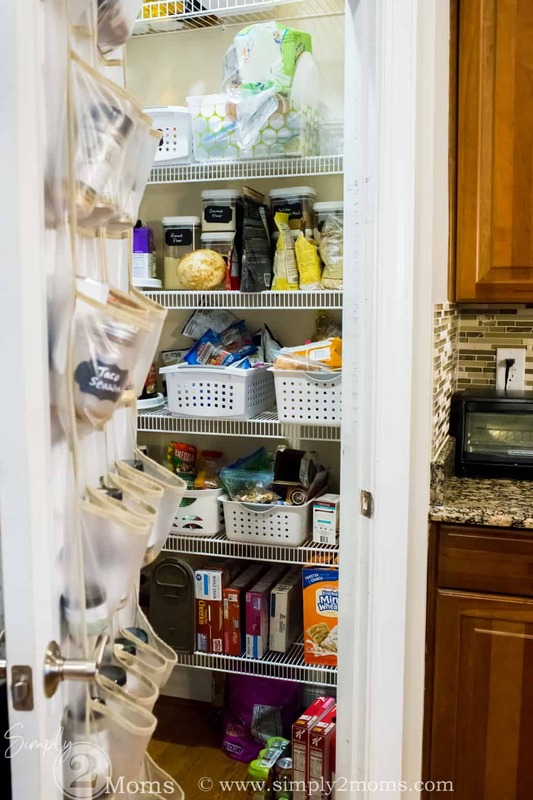 Not only does it look neater to have all the bags contained, but it also helps reduce the chance that small bags get lost. 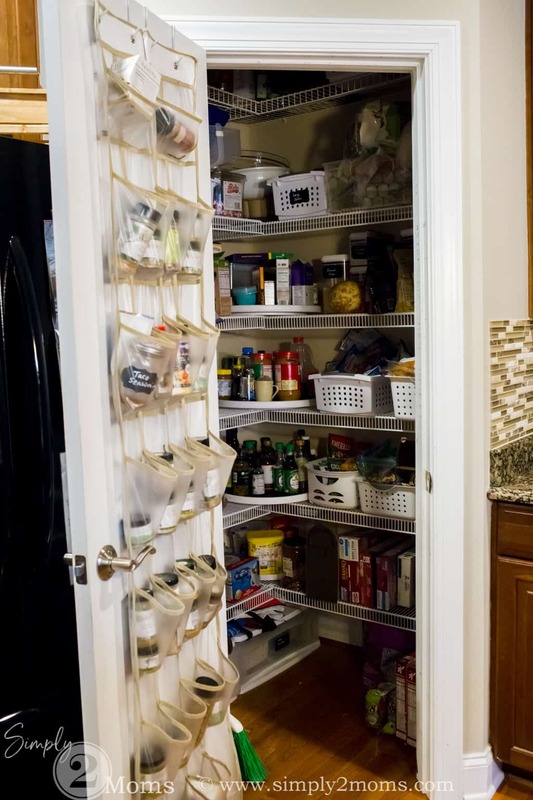 And since we have some different dietary needs in my family, this lets each person easily find things they can eat! You can find similar baskets here. 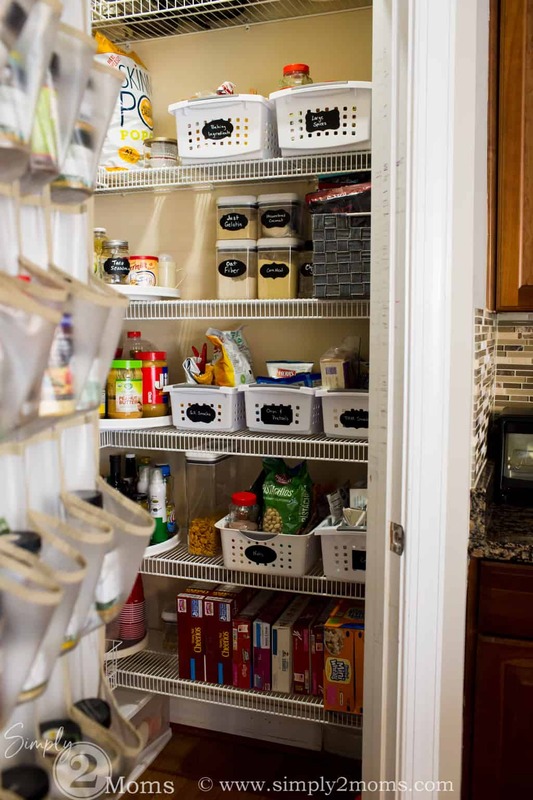 I use larger versions of those baskets for categories that have more to store. You can find the larger baskets here. And for variety, I also used some of these larger woven baskets. You can purchase similar woven baskets here. 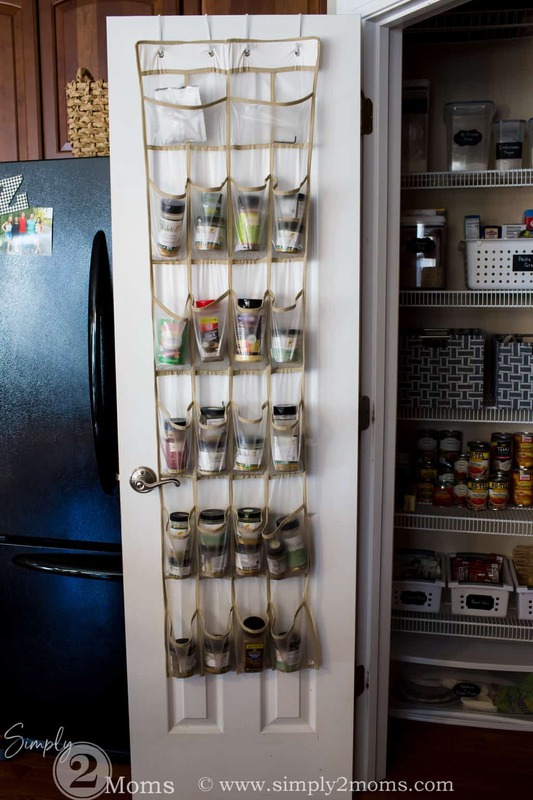 I love these canisters from Better Homes and Gardens. They come in a big variety of sizes. If money were no object, I’d put just about everything in them! I have my unopened Trim Healthy Mama products contained in another woven basket. I love these stackable drawers for the area under my shelves. 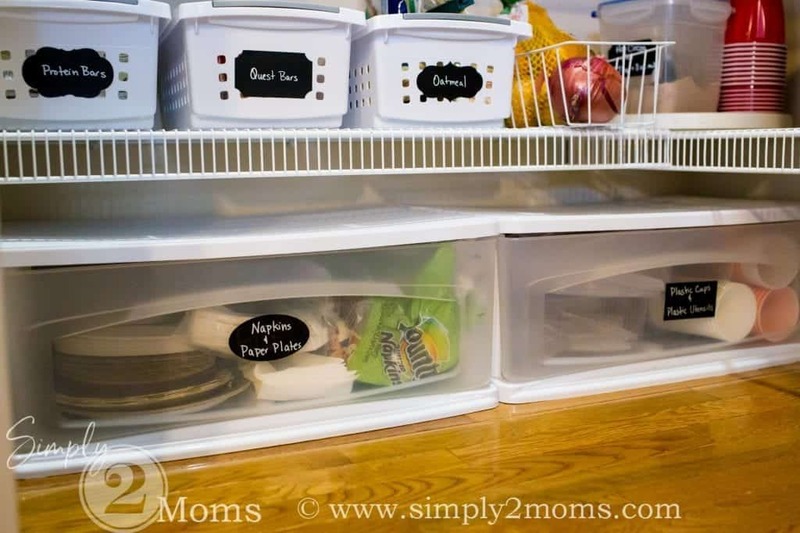 The drawers offer a little extra protection from the crumbs that invariably get on the floor! 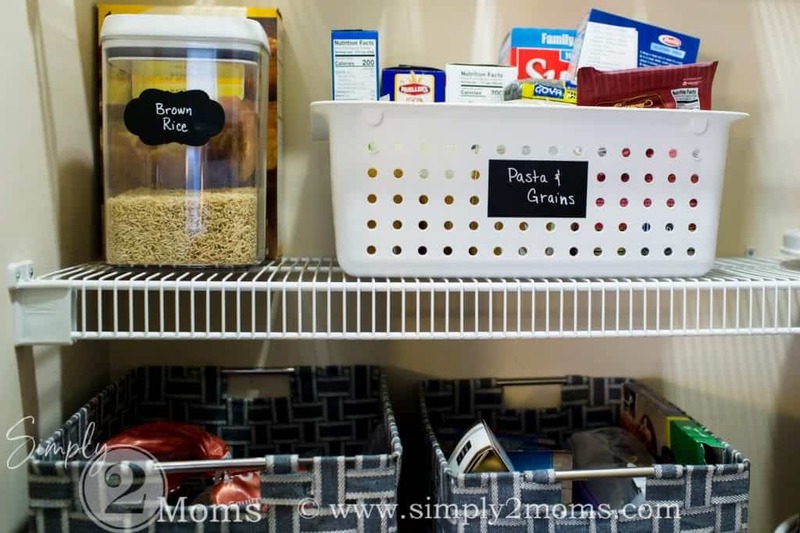 These reusable chalkboard labels also help everyone to find everything easily. Everyone loves a good before and after, so here are your comparisons! 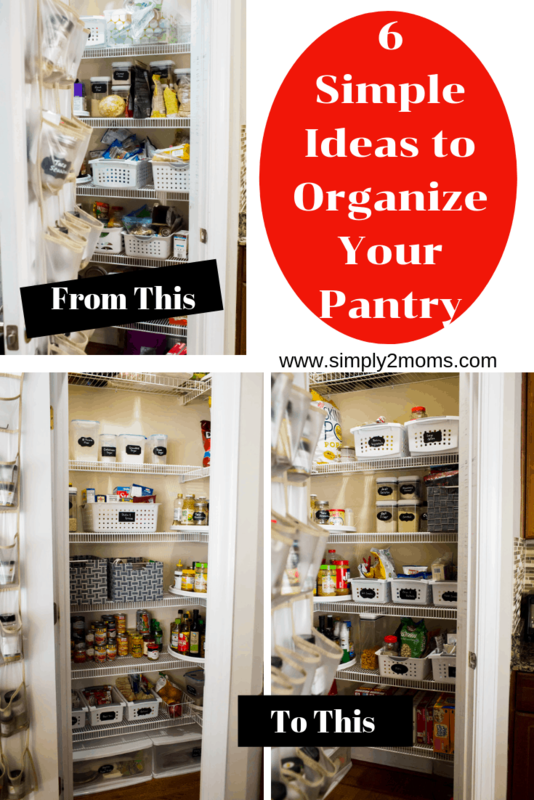 I hope these simple tips will help you organize your pantry too.